As a SaaS company, you need to generate audience in order to get new customers and scale your business. There are both active and passive ways to do this, but of course the passive ways take active energy to set up and then maintain. Nothing in life is free, and that is especially true in marketing. This is why marketing is so hard, and you need to think of it like any other part of your business such as building your product, doing sales and customer support, looking at finances, and the myriad of other departments and areas that are ongoing in your business. In this 5,000+ word post/guide, we look at the popular SaaS marketing strategies across the different channels that are proven to work. As a help to you, click a below link to take you to that section. SaaS is a type of business that is especially well suited to SEO. If you’re operating a low monthly cost SaaS company, then you need to have a low cost per acquisition (CPA) and low churn in order to turn a profit. At the same time, you need to reach a scale of potential customers and then convert them into a long term client. And of course, you have to do this profitably. Thus, SEO is extremely powerful for SaaS companies. Here are a few of our favorite SaaS SEO strategies. I should also say: before you go and start doing a lot of advanced tactics and strategies you should make sure you have done proper onpage SEO, have an internal linking structure that makes sense, have XML and HTML sitemaps, and that your website has reasonable load times. All of these are groundwork for the other SEO work you will do. If there is one SEO rule that most SaaS businesses break, it’s not building pages targeted at the problems that you are solving and including the features that your product has that can convert in new customers. I was contacted once by a company that wanted to rank for some very competitive keywords that mapped to their individual features, but they had one “Features” page and no individual pages for each of their features. This is incredibly low hanging opportunity for you. Using a look like SEMrush or Moz Explorer, you can identify the keywords around your features and then build out pages that target these terms in your <title> tags, H1s, H2s, and within your copy. 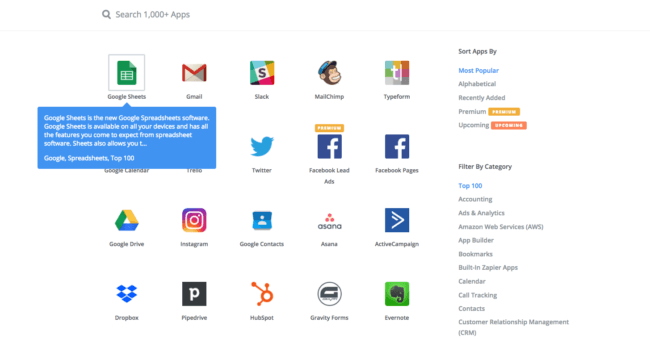 These pages are also more specific than something like what Zapier would use on their homepage, which is “The easiest way to automate your work”, which is not something people search for. Instead they use specific pages for their 1,000s of integrations as well as the products they integrate, all targeted towards “Brand + integrations” such as “Gmail integrations”. If I was actively looking to grow the number of marketing providers listed on Credo, I would build out specific pages for “Lead generation for marketing agencies”, “Lead generation for SEO agencies”, and the major types of agencies and consultants that we work with. Since you run a SaaS company, you can know specifically who your target is at each company. “Stripe metrics for entrepreneurs” is much stronger and more specific than “Stripe metrics”. To execute on this strategy, do a survey (or use a data enrichment tool) to identify the three or four most common users that you have, then take your main keywords and build out pages specifically for each of those users. Structured data is a great way to set your search result listings apart from the pack. You’ve put all this time and effort (and money) into getting yourself ranking, so why not take advantage of something that not many in your vertical are doing and enhance your search results? By marking up my pages with AggregateRating schema, I can get star results showing in the search results for providers on Credo. You could take this same strategy and apply it to your SaaS company if you have multiple products that you sell. You could also do this on big content pieces where you get reviews, as these stars will show in the search results as well. One area that a lot of SaaS companies never consider when building out the site (probably because the ROI is harder to measure, though the traffic is easy) is becoming the resource for their industry to attract others when they are more in the research phase, and then to take them down the consideration -> purchase steps of the sales funnel. But this is an amazing way to open up the top of your funnel, rank well in the longer tail of keywords (less volume per keyword, but more permutations) in the short term, and build the links that will help your head keywords rank better in the long term. 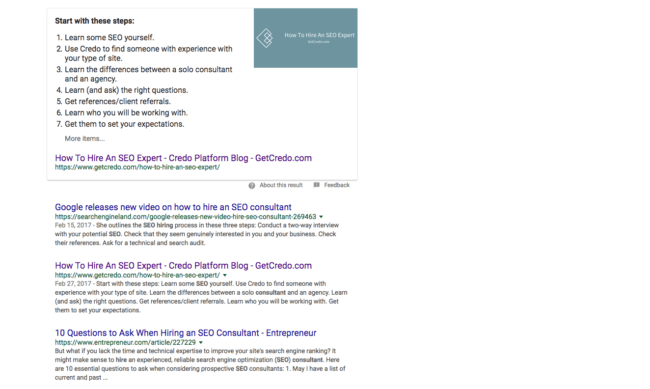 For example, I targeted the term [how to hire an SEO expert] here on Credo. We’re not a SaaS company, but this strategy has worked incredibly well for us to drive more traffic and leads through our conversion form. If you look here, I have earned both the Answer box (more on that below) as well as the second organic listing, with only Google’s above mine. People may go to Google’s listing because, well, it’s Google and it’s a good video, but if they’re clicking on another you can bet they’re coming to Credo. So how do you target these? First you have to do your keyword research to determine your main keywords. Then you can either use SEMrush or the Google Suggest trick coupled with the Keywords Everywhere Chrome extension to identify “how to” and “what is” questions that your audience is asking. Of course, remember that “what is” questions tend to be broader and more geared towards beginners whereas “how to” are usually a bit less beginner and looking to learn specifically how to do something. In SEMrush, you can put in your competitor’s URL and go to “Organic Research”, then filter down to “How to” keywords and then sort by best ranking. This tells you where you have an opportunity to write that amazing piece of content that answers the question, and also to outrank your competitors! If this is your competitor, you have a lot of opportunity. If this is your site, you do as well! The opportunity presented by these cannot be understated for SaaS businesses, as claiming them allows you to get the majority of the clicks and sets you apart as a thought leader for the topic. Layer on top some smart retargeting strategies and you’re going to grow your business. The post linked above goes much deeper than I will here, but to get these featured snippets you need to write in such a way that Google can parse them easily. Google loves structured data! Succinct answers (~200 words) using the keywords you are targeting. These above three are listed in the order in which featured snippets appear, but you have to do the research on your specific vertical to determine a) if featured snippets are showing in your vertical and b) the type of structured data they are rewarding. And within SEMrush, you can also identify the keywords where your competitors have snagged Featured Snippets so that you can target them yourself. I know I only signed up to give you five SEO strategies in this section, but this one is too valuable to not tell you. 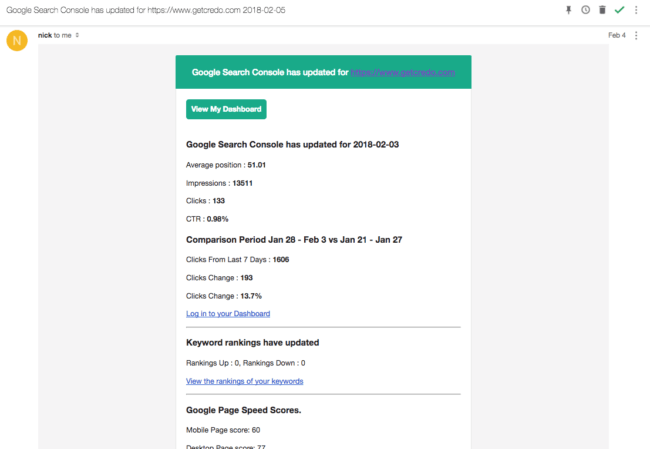 Using a tool like SEMrush/AHREFs/Moz Explorer, you can enter your competitor’s website and see all of the keywords for which they are ranking along with that term’s monthly search volume and your competitor’s rankings. This is just a snapshot of the questions they are ranking for (and you can do this for head term/large volume keywords as well) and not all of them are relevant to the types of businesses I am targeting, or the people at those businesses that I am targeting, but I can glean some good topics from this list and set out to target those keywords and outrank my competitors. The key here is to break down the keywords between content (informational) and conversion-oriented queries so that you can create and target the correct page for ranking. For example, a “how to” article will not rank on a product page. However, one great hack for ranking for a competitive term where your product page does not yet (and you are actively targeting it with link building) is to write a large piece of content that is either an industry-leading guide or outlining a list pertaining to that term. Content marketing is sometimes a tough sell for SaaS companies to implement. You or your cofounders (or bosses) are likely technical, which means that you or they want everything measured as precisely as possible. If you are venture funded, then you also have investors who insist on seeing a direct outcome and spending faster in order to grow faster. You do this at your own peril, as a well-constructed and executed upon content strategy can return traffic and customers many times over paid and at much cheaper costs. It takes upfront strategy and investment, as well as a willingness to adjust over time, but when done right will set you apart from your competitors and help you convert more profitable customers. We’ve already talked about keyword research above and why it’s so important for SEO. By using 1) a combination of creative brainstorming driven by data-driven research and b) competitor analysis you can identify a lot of keywords that you are not currently ranking for, but should be. Now the challenge is building those pages. As you are a tech company, you probably think in terms of “what is scaleable” so that you can roll out tens/hundreds/thousands of pages at once. This may work well for directory-type sites, ecommerce sites, or rolling out a batch of product pages at once, but most SaaS companies don’t have this luxury. You realistically have your homepage and 6-10 feature “product” pages that show what your product does and then tries to convert people. rank your existing conversion-driving keywords higher. The best way to do both of these is to improve your website’s strength overall through link acquisition, but that must be coupled with active content development to grow the number of pages on your site that can target the types of terms mentioned in the above section. Then you can work on strategy 3 below! The best way to produce consistent high quality content is to find the type of content you love to produce and your audience loves to consume. If they love podcasts, you can do audio and grow a podcast. If they read blog posts and are active on social media, then do that. If they watch videos, then do that. The key is to find the type that you can produce consistently and at high quality. You might find it interesting to know that this post you are reading is part of my consistent high quality content strategy, and our CredoCast video series that gets broadcast via YouTube and iTunes is the second half. We do two posts a week, one like this and the other video that is then put into other formats as well. Pick your type of content and commit to publishing on a specific schedule. I think you’ll be amazed. Remember: this is the bare minimum to do. Don’t go crazy figuring out promotion schemes and such yet. Get into a consistent content rhythm because everything else builds on that. Admit it: you don’t know everything. If an influencer (someone well followed in your industry) is truly doing the work, then you can learn from them. A great way to get content that can spread and teaches you at the same time is to interview these respected influencers. Before you go and start reaching out to people with big followings who have no relevance to your audience, as yourself who you and your peers listen to and get advice from through their content or businesses. Who do your peers respect? Who are you already connected with? I like to start this strategy by interviewing a few people that I am friends with who have a bit of a name. Interview them about their area of expertise and then promote the heck out of it. You might only get 50-100 views on it, but that’s where you start. At the same time, even people you might know who are super busy will rarely help you out with something at the start. Build out a base of content and then use that consistency to show them that you are serious about it. Every well-followed person has been interviewed in places where the interviewer drops the ball, stops promoting the content, and more. Be the person that goes above and beyond. And do it consistently, and promote it to your audience. At the same time, ask them to share it with theirs. If they’re proud of how it came out, they will! To take your content production to the next level, layer on guest blogging and PR campaigns to help you build natural links back to your site as well as to raise your and your company’s profile within the industry. The ultimate goal is to arrive at the place where your content promotes itself when you hit Publish (or your scheduled post goes live). There are many ways to do this, and the one that you choose depends on your current situation. If you have a lot of connections in your space and are known for writing great content, getting guest posts with a bit of outreach will be pretty easy. If you need to, you can trade guest posts with them as well if that is important to them and necessary in order to get a post on their site. Produce the single best piece of content in your space and promote it everywhere. Reference well-known people in your space and then email them to tell them you mentioned them and gave them credit. 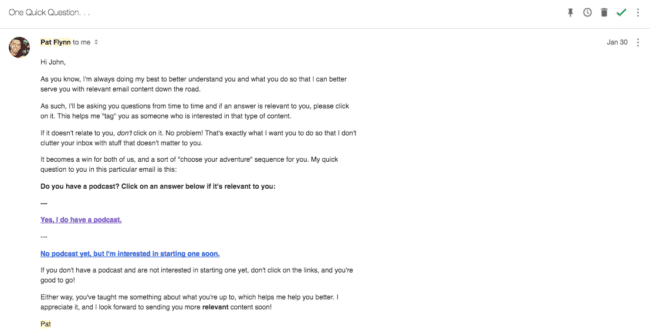 Email people with newsletters rounding up content in your space and ask them if they’d consider including it. Start an interview series on your blog where you reach out to influencers and people doing interesting things in your space to start building your backlog of content and kickstart relationships in your industry. Number 2 here dovetails exactly with the influencer strategy laid out in Strategy 2. If you’re able to get high quality guest posts, then you can use the ones that go live to leverage yourself into other harder to land opportunities. But remember, at the end of the day you are looking to add as much value as possible to every website where you write. We’re not “guest posting for links”. Once you have a base of great content on your site and content around the internet that points back to your site, you can layer on PR. This works best when you have a very strong story and are practiced with being interviewed, being succinct in your speech, and can explain things well. If this isn’t a strength of yours, don’t force it! The next level of content marketing for your SaaS company is to use your content to capture email addresses of potential customers who are interested in the areas that you are writing about. While this isn’t the end of the strategy (you then need to take them down the funnel, so see the next strategy), it is the middle step to move these potential customers from Research to Consideration. When they give you their email address, they are more committed to you than a simple visitor via organic search. You’re starting to build fans. We’ll talk about drip email campaigns below, but this dovetails nicely into building your email list for marketing and retargeting purposes. 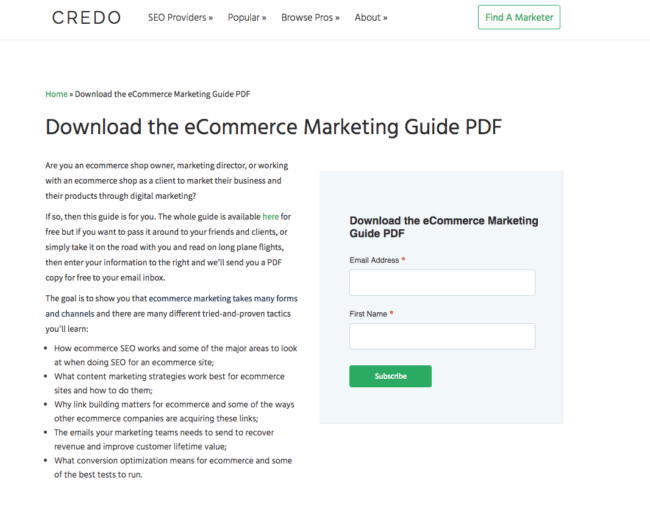 Of course, all of the content they get in the download is also available publicly on different pages that target specific terms (ecommerce SEO, ecommerce content marketing, etc) but if they want it to take with them they can do that as well. We also drive traffic to this guide by targeting ecommerce employees on Facebook. This funnel is going to be rethought as it’s not as effective as I’d like, but we’ve at least started and have learned what works and doesn’t. The strategy here is to take the content you planned ahead of time and publish consistently and then to roll it up into an epic guide that people can download. If you try to create something like this before you’ve established yourself on the topics you’re covering, you will fail. One of the areas where a lot of SEOs and marketers fall down with a focus on keywords is with creating content throughout the buyer’s journey. We’re so focused on new traffic that we forget our responsibility to drive people to the point of conversion, which you can only do when you understand their intent for the keywords or sites they visit from. 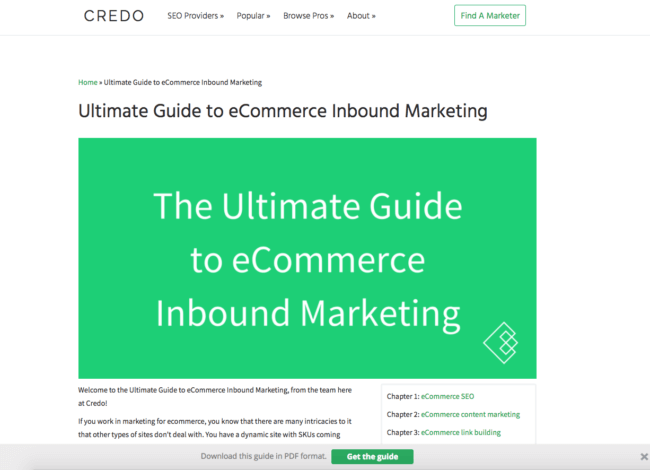 This is where you start to build out funnels for your traffic to understand the buyer journey and take them from research to consideration to buying/subscribing. They’re not tied to a brand yet, though they may have the market leader in their mind. They are starting their search and trying to find those that will educate them and help them make the right decision. This content should then lead them to download a piece of content (if they’re interested) or do another “microconversion”, where they take some further action like subscribing to your weekly email, following you on social media, or sharing an article. They’re also probably looking at your Features page (you have one of those, right), your demo videos (you have those too, right? ), and other downloadable content to help them come to the right decision. As you can tell, this content is much less editorial and more focused around being useful. If you have competitors (and I’m sure you do), then go ahead and create a page on your site comparing yourself to them honestly. They might be better for a specific customer and you might be better for another one, so give a clear recommendation depending on their specific needs. You can build trust with your potential customers if you do this right. This stage is where the rubber meets the road and you make your money. At this stage, your prospect is ready to give you their credit card. These take them from the “maybe I’m ready” to understanding not just what your product does but also what it can do for their business. You should remember that customers are risk-adverse and want to know that they are making a smart choice. All of this content can help them, and a smart email strategy (strategy 4 below) can help push them over the edge to becoming a customer. You are probably as tired as I am with the SaaS email marketing strategies out there. “Optimize for mobile”. “Get them delivered”. In this section we’re going to dig into 5 specific email marketing strategies that might make sense for your SaaS company. If you have someone internally to do this, great. I would say to only do it once you have committed to it as part of a broader promotion strategy based off the content you are doing already. I’ve seen it work when you are not already producing your own content, but it is much harder to then bring people back to your site and have them considering your product. This is also very hard to automate at scale and maintain high quality content with a high signal to noise ratio. The best way I’ve found to do it is to save articles that may be of interest to Pocket and then tag the article with a specific tag so that you can separate personal from business-related articles. There are some good products out in the market that can help you speed up some of this. My favorite for personal newsletters is Revue, but that is not a great solution for businesses as they do not allow you to use custom themes. Your newsletter ends up looking like every other business’s newsletter, which is kind of like using Medium with their branding for your blog (don’t do it). Now your challenge is going to be growing your email list, which we will cover in another post. This strategy will be part of a broader funnel strategy, where you first drive new people into your email funnel via webinars, content upgrades, and more. Once your potential customer is committed to a certain level (such as a webinar to learn more), then you can start emailing them with useful content on how to accomplish what they can use your software to accomplish. If you’re the company from the beginning of this post that is helping companies with their SaaS metrics, you know that they are probably looking for more information and strategies around pricing, calculating their important metrics, improving their metrics once they know them, and a lot more. So you can go deep into here. What he has done here is ask me directly which one I am, which them puts me into that specific drip campaign so he can serve me more relevant content that he has tagged within his email marketing software. Brilliant, and something more SaaS businesses doing great content marketing should be doing. This strategy continues on content strategies 1 and 4 from above. Once you’ve brought people to your site and converted them into an email subscriber or are following them around the internet via retargeting, now you can do your bigger PDFs and downloadable launches and build sell sequences into the drip campaigns that follow that subscription. Let me put this bluntly – you should not be creating content or sending emails that do not fulfill your ultimate mission of building your company. If you find yourself saying that you are doing it “for awareness” or “good will”, then take a step back and try to realign yourself to your mission. Sell sequences, which are basically harder pushes to sign up/subscribe/pay/attend something like a webinar or conference, can be sprinkled through your educational drip campaigns from above. The right cadence will depend on your specific content, but the reality is that most businesses today aren’t doing this strategy at all. There is no push towards something greater, and you are doing yourself a disservice by not asking them to take action. In fact, I’d say you are doing your customers a disservice by not asking them to take action. Have a standard call to action at the bottom of each educational email you send. Sprinkle direct sell emails between every 2-3 emails you send educating them. This is enough to get across that you can meet their needs, but not so much that they’ll be annoyed. So the strategy overall is to do consistent content that ranks that then rolls up into a bigger launch to gather emails and get press which then converts subscribers into customers for your SaaS product. This one is more geared towards winning back old customers and keeping your current customers engaged. When you look at your SaaS, what questions do people typically have for you that flood your support queue, Twitter DM box, and other crazy places where you often forget to answer? This is prime content to use to build either a public facing resource center (which can, interestingly, drive bottom of funnel traffic for people seriously considering your product) or to plan out new engagement email campaigns to keep people coming back to use your product. What this email does is keep me engaged with the product. Every day I’m going to open that email and look at the stats to see the difference from the previous week and how other stats have changed. If I see something out of the ordinary, I can dig in further. It’s a “Sanity Check” every day if you will. Asking for feedback on the cancellation confirmation page and then via email if they did not provide feedback on why they left. Obviously you will need to segment your list and trigger these different emails at different times and to different people. The first can be done on the same day of the week each week, the second as you have updates, but the third and fourth will be action based. For these two you can use Drip, ConvertKit, Intercom, or roll your own solution (not really recommended if you’re just starting out as you have more important things to focus on, like getting new customers). If using Drip, Brennan Dunn has a great course. So there you go, 15 SaaS marketing strategies that you can use to apply to your business to grow your traffic and your revenue. Leave a comment with what else you’ve done that has moved the needle for your business!